One of my goals with the survey is to gain more insight into the challenges that people face in trying to accomplish family dinner on a nightly basis. I also hope to better understand why people value family dinner and what they see as its most important benefits. I hope to get a wide range of experience from respondents: families that find family dinner impossible and those who are more successful at it. We can learn from all kinds of experiences about the best strategies to help families. Usually research surveys unfold over months, and this effort is barely a week old, so these are preliminary results. Still, some interesting ideas are emerging from the survey responses. 1. Family dinner time is the time to connect, and eat healthy foods. Overwhelmingly, the most often stated reason that family dinner is important is "family dinners give us a time to connect and be together." The next most popular response, thus far, is that "family dinner makes it easier to make sure my children are eating healthy food." Somewhat surprisingly, parents were less likely to report that "keeping kids off drugs" or "doing well in school" were their most important reasons for family dinner. This is interesting because much of the academic research community pushes these benefits as the most salient to parents. 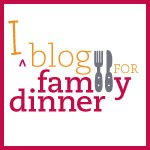 The message here is that, for many people, family dinner is about creating connections with partners and children TODAY. Family dinner is about getting kids to eat healthy foods NOW. Forward projections of how it might benefit kids many years down the road may not be foremost on the minds of busy parents. Family dinner can build a great foundation for kids as they grow up, and thus can keep them focused on school and off drugs, but the results and benefits of family dinner can be seen immediately among these respondents. 2. The Best Strategy for Having Family Dinner: Make the Commitment. The vast majority of respondents said the most helpful strategy for accomplishing family dinner was making a conscious decision to commit to it. This beat out every other reason, although knowing how to cook quick meals at home was another very popular choice. This mirrors my personal experience. There have been times when family dinner just seemed too hard, especially when the kids were little and demanding work schedules pulled at all of us. As a family, though, we decided that family dinner was too important to let slip by; we compromised and found a way to make it work. We eat late; we share the cooking and the clean up; we found a way. Merely taking the step and deciding that family dinner has value for you and your kids turns out to be critical. 3. Family Dinner is "Extremely Important" even for those who manage it 2 or less nights a week. This is a "family dinner" survey, so most of the people who are motivated to take the survey had high opinions of family dinner. Not a surprise, really. What surprised me, though, was that the respondents who rarely had family dinner (that is 1 or 2 nights a week, or never) still felt like it was "extremely important." Honestly I was expecting a little backlash! To me, this indicates that families want HELP making dinner, and family time, happen. This is something that parents want to do. Families could use more support and less blame as we promote healthy eating and healthy habits for kids. This is an important message for educators, policymakers and researchers. I am just scratching the surface of the data here. There is a lot more in the survey to learn from and to share, and I hope to keep collecting data. So many people were interested in learning about the results, though, I wanted to give a hint at some preliminary findings. Keep checking back for more analysis. For the record, this survey is not scientific because the sample selection was not randomized. In fact, outreach was biased due to the nature of the data collection. Surveys were administered in person at school health fairs and workshops dedicated to healthy eating. The survey was also administrated online, with promotion through agents who are expressly interested in food, parenting or healthy behavior. The results were analyzed qualitatively to assess individual opinions about family dinner, and any cited statistics are not representative of the population at large. To date, the survey has been administered in Brooklyn, NY, in South Dakota, and online. So why even do this survey, if it's not scientific or randomized? Well, I think that we have to get information about family dinner and its challenges from real parents who are on the "frontlines" of making healthy choices for their kids. Even in a biased sample, we can learn lessons about people's experiences that are valid and important; we just have to be careful not to generalize. We will keep the survey open and available on the Eatdinner.org website and here. Please feel free to add your own experience and share the link with others!